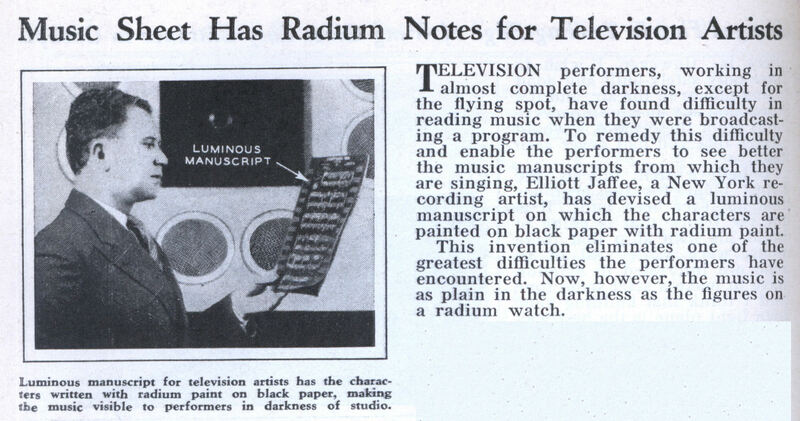 TELEVISION performers, working in almost complete darkness, except for the flying spot, have found difficulty in reading music when they were broadcasting a program. To remedy this difficulty and enable the performers to see better the music manuscripts from which they are singing, Elliott Jaffee, a New York recording artist, has devised a luminous manuscript on which the characters are painted on black paper with radium paint. This invention eliminates one of the greatest difficulties the performers have encountered. Now, however, the music is as plain in the darkness as the figures on a radium watch. Ohh, is that a flying spot scanner in the background? Those were commonly used for television in some countries. They were the ones that required total darkness in the studio. However what I wonder is: Why didn’t they just place the musicians in another room? I’m sure they were in the same room so they could see what was going on and be able to play the right music at the right time. TV screens were, what, tiny things? (5-10 inches in a huge cabinet?) Having them in another room, watching those tiny TVs would have been fairly inefficient, I think. We in the 21st century can’t imagine television without a CRT. When did the image pickup become all electronic? I think the late 1920s/early1930s, the all electronic TV system was invented. I believe the 1936 Olympics used electronic cameras. Philo Farnsworth demonstrated the first image dissector September 10, 1928 in San Francisco. He was 21 at the time but he had the original idea when he was 14. All television systems were based on his and Vladimir Zworkin’s patents. Zworkin invented the electromagnetic deflection crt in 1929. Prior to these two inventions television as we know it did not exist. There is an article on this site about Farnsworth. This sounds like the music manuscripts were created using the same stuff that made watches glow in the dark. It’s hard to believe the glow would have been bright enough to make the music legible. I wonder if the guy who made the music boards had problems in later life, or perhaps he didn’t have to do it for long enough for it to become a health problem. 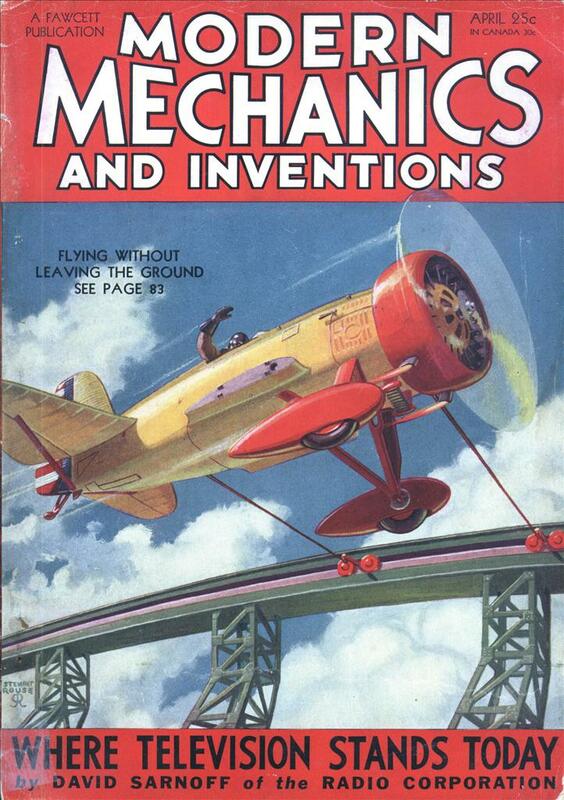 The quantity of Radium on each page was probably nanoscopic. The stuff was over a million dollars a pound! This is fascinating. I never heard of this before. It’s like a half-step between mechanical television, and fully electronic television. jayessell, you’re right about the minuscule amount used, but you’re wrong if you’re assuming small amount = safe. Radium is dangerous to work with even in infinitesimal amounts, and drawing with it – which often required the user to do something called “lippointing”, or using the mouth to moisten the brush so it would keep a point – could result in ingestion of toxic doses of radium. During World War I, watch manufacturers began to paint watch hands and numbers with radium so as to make them readable in dark foxholes and night battlefields. The fad caught on, and by the 1930s almost all watches and even some clocks were painted with radium. Even given the tiny amount of radium in the paint, workers were exposed to so much of it because of lippointing that a huge percentage suffered from bone loss (especially in the jaw) cancers, and miscarriages. Interestingly, by 1931 the danger of drawing with radium was known, but it wasn’t until 1935 that companies were forced to be more careful. I mentioned some of that in a previous Radium post. By the way… 50 million a pound in 1930ish dollars. Makes me wonder just how popular it was (in broadcast studios), and how many might have ultimately suffered from radiation exposure diseases (mostly among the staff/musicians constantly handling the sheets day-to-day) starting well after the periods of time involved. Your post was deleted, but they knew Radium was dangerous. sheet music didn’t last long. At YouTube there are many clips from late 1930s BBC TV experiments. This was taken in the CBS-TV experiment studio. I recognize the white painted electric eye array form another photo.